Prosecutor General’s Office of Ukraine said on April 1 it declined Tbilisi’s request for extradition of Georgia’s former President Mikheil Saakashvili, who now serves as Ukrainian President Petro Poroshenko’s adviser. Saakashvili is wanted by the Georgian authorities on multiple criminal charges, which he denies as politically motivated. Court in Tbilisi ordered Saakashvili’s pre-trial detention in absentia in August, 2014. “As a result of review of [Georgia’s extradition request] Prosecutor General’s Office of Ukraine has concluded there is a significant risk that extradition request for Saakashvili was made by the competent Georgian agency with the purpose of his prosecution for political motives,” Ukraine’s Prosecutor General’s Office said in a statement on April 1, adding that extradition of Saakashvili would be in conflict with the European Convention on Human Rights. It also said that the Georgian chief prosecutor’s office has been notified about its decision to reject the extradition request. A close ally of Saakashvili, former Georgian MP from UNM party, Davit Sakvarelidze was appointed as Deputy General Prosecutor of Ukraine on February 16, joining several other former Georgian officials who took senior government posts in Ukraine, among them Eka Zguladze, who is Ukraine’s Deputy Interior Minister; Gia Getsadze, who is Ukraine’s Deputy Justice Minister, and Alexander Kvitashvili, who is Ukraine’s Healthcare Minister. 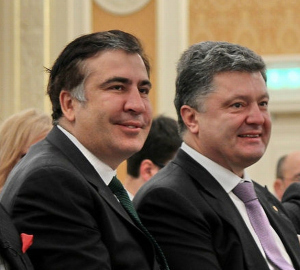 On February 13 Saakashvili himself was appointed by Ukraine’s President Petro Poroshenko as his adviser and head of International Advisory Council on Reforms. Georgian Chief Prosecutor’s Office complained in February that despite its request, Ukraine had “not cooperated” with Georgia and refused to extradite Saakashvili.